Name the Indiana Jones relics! Now with the right colors! Sorry, my bad, don't take a photo, clean it up in photoshop, send it to illustrator, add numbers, fail to save to web with the numbers intact, send back to photoshop to rasterize, then save as a jpg. Somewhere along the way it messed up the colors. 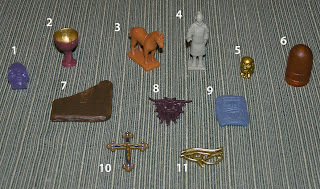 Name the Indiana Jones relics! 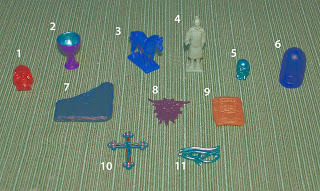 If you can name them all, you probably should be a professor of archaeology! Freedom is the right of all biodegradable beings! 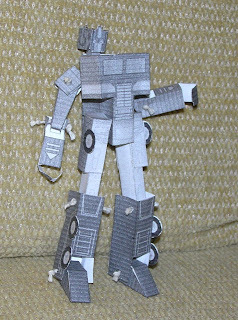 When I got to work this morning, to my surprise Paper Optimus Prime was waiting on my keyboard! I was pretty amazed to see that he actually transforms! I have to build that Megatron now! Something Better than a Silica Packet! This is pretty cool, it came as a bonus with a Monitor stand I purchased the other day. 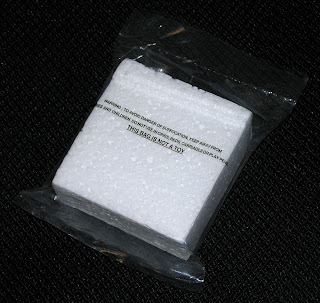 Its a piece of styrofoam in a plastic baggy. It is so much fun. 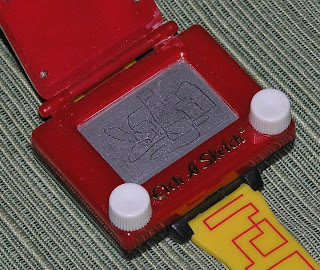 I played with it for hours; swinging at the park, movies at the theatre, video games while it rained. I love my new styrofoam in a plastic baggy thing! But then I read the warning label, looks like I might have to get rid of the plastic baggy part, but the styrofoam I can keep forever! Did I capture the job perfectly or what?! Back when I was on the board of directors of a major firm of business, I used to wear watches to catch the eye of the CEO to get kickbacks and raises. The collection is quite extensive, quite expensive, and quite out of batteries. 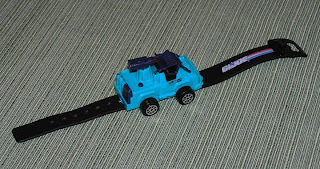 Today I feature the GI Joe Armored Car Watch. 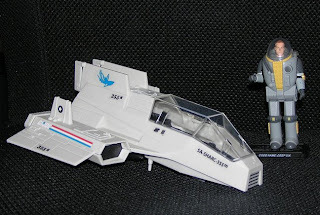 It features a removable armored car from wrist band, electronic noises (the standard war sounding ones with the little high-pitched Eeeeeeeeeeeerrrrr Ka-Booooomm! 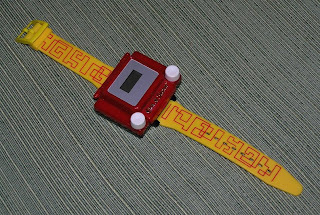 ), red light up cannon, and press a side button, front end rams out the time piece. 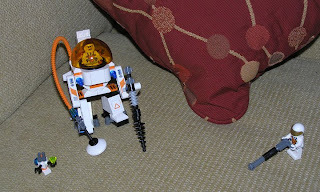 Its slightly damaged missing the back end weaponry, probably from those pesky board room fights. 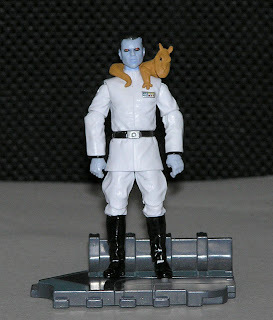 I wonder how Thrawn dealt with his Ysalamiri droppings on his shoulder? I'm not the biggest gamer in the family. I have been known to abandon my friends, and pledge allegiance to the sworn enemy for an easy way out. 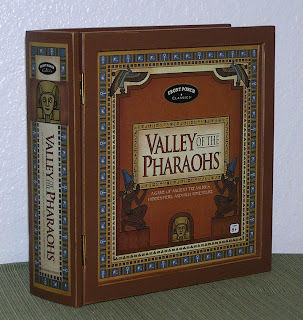 This Valley of the Pharoahs game has caught my cool radar for sure. To start, its packaged in a book box. Perfect for a decoy book shelf, makes visitors think I'm well read. Lots of interesting pieces and effects come with this game! The main board is made from fabric, feeling like an old lost treasure map. 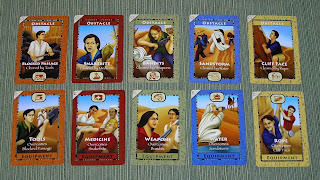 Camels are the players pieces, real metal coins for money, and cardstock for the various keys and tile pieces. A variety of cards help and hinder you on your way to uncover the Sceptre of Amun-Ra, your goal to winning the game! Did I tell you it comes with a 'Wheel of Fate' yet? 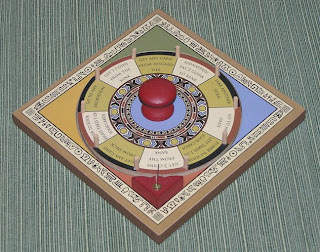 You choose to spin if your are at Oases (which helped me almost win the game the first time I played). The wheel is real nicely crafted as well. 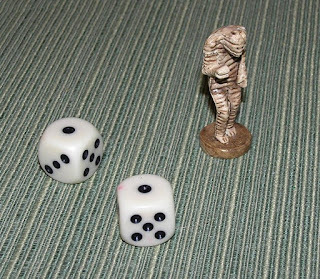 Who ever rolls doubles controls the mummy! 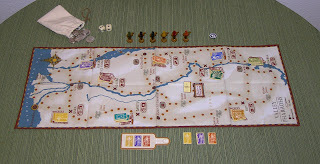 The Mummy is used to follow, and steal a turn from other players. Its fun to control the Mummy. But scary when the Mummy is following you! 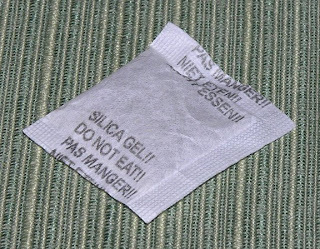 The game also comes with this silica packet! Okay that last item wasn't as exciting as I thought, but the game is still wildly fun. My first run through of three players, was pretty close, made for an exciting game. I lucked out and found my copy on clearance at Burlington Coat Factory of all places (there was a coat stuffed in the box too I guess). Its also on clearance right now at amazon for a tiny amount of ten bucks! I recommend you try it out, if your looking for something else to play. Hey Formertrans fans! Rumor has it 25th anniversary Optimus Prime is on sale at JC Penny dot com for 34.99. That's a little more reasonable than the ridiculous suggested price. Although, I'm sure local retailers will have to clearance theirs too eventually. Just thought I would let everyone know. I've seen Hound pop up on several toy blogs early this year, he must be a fan favorite. 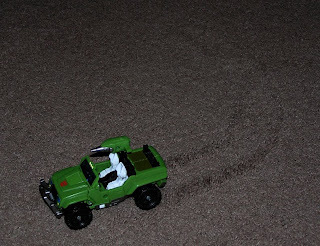 Here he is making tracks in my carpet. I'm a bit disappointed in him in that he is too complicated to transform quickly. I'm getting too old and stupid for Transformers, so I like them when they are a no brainer and fast to transform, like the original transformers, very blocky and simple. 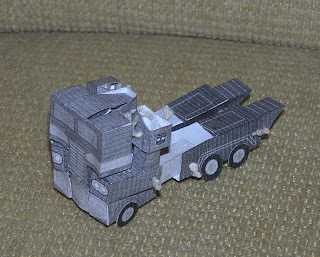 But he looks good in vehicle form and that is how most of my Classics are formed in, so I'll keep it for now. 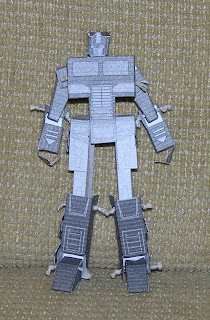 Deep Six got his name for his six points of articulation (two wrists, two elbows, and two shoulders). Unless maybe his head moves, under that dome, then it would be Deep Seven points. 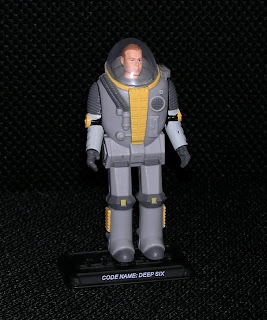 Deep SIx pilots the SA-SHARC-355m, that can submerge and fly. 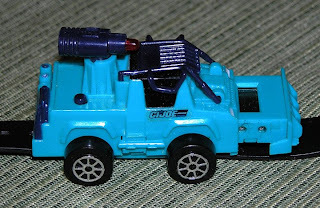 GI JoeTorpedo can ride on the base side, but Deep Six forgot he was there and landed anyways, thus crushing Torpedo. 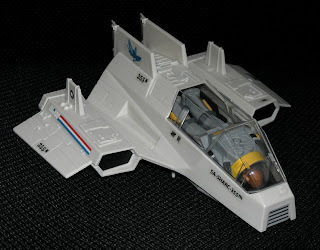 The SHARC does not look comfortable to pilot. That or Deep Six is passed out drunk inside, hard to tell. 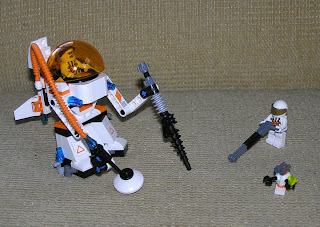 I hired this skilled team of Lego men Jones, Hendricks, and Robot to find m&m's under my couch cushions. So far they keep finding green crystals.